In this paper, an operator-based robust perfect control for nonlinear semiconductor refrigeration device with uncertainties and perturbation is considered. For the research about the properties of the semiconductor refrigeration, an aluminum plate with Peltier device is very representative. Therefore, the perfect tracking control performance of semiconductor refrigeration can be investigated by using this aluminum plate with Peltier device. Moreover, the operator based robust right coprime factorization (RRCF) approach is convenient in analysis and designing control system of nonlinear plant with uncertainties and perturbation. Based on the above reasons, an operator-based robust tracking control design for nonlinear semiconductor refrigeration device with uncertainties and perturbation is investigated by using an operator-based robust right coprime factorization approach, where the operator-based disturbance and state observers based on nominal plant properties are designed to compensate the effect of uncertainties and perturbation. A realizable operator controller is designed to improve the control performance and to realize the perfect tracking. The sufficient condition of robust stability for the designed system is derived. The robust stability condition ensured that the output tracking performance is realized. Finally, the effectiveness of the proposed design scheme was illustrated by the simulation and experimental results. A. Wang, Z. Ma, and S. Wen, “Operator-Based Robust Nonlinear Control Design and Analysis of a Semiconductor Refrigeration Device,” J. Robot. Mechatron., Vol.29, No.6, pp. 1065-1072, 2017. J. Chavez, J. Ortega, J. Salazar, A. Turo, and M. Garcia, “SPICE model of thermoelectric elements including thermal effects,” Proc. 20th Int. Conf. on Thermoelectrics, pp. 1019-1023, 2000. M. Zheng, Y. Wang, A. Wang, D. Wang, W. Liao, and Q. Zhang, “System design for aluminum plate with peltier device using an operator-based observer,” Proc. the 2013 Int. Conf. on Advanced Mechatronic Systems, pp. 63-68, 2013. 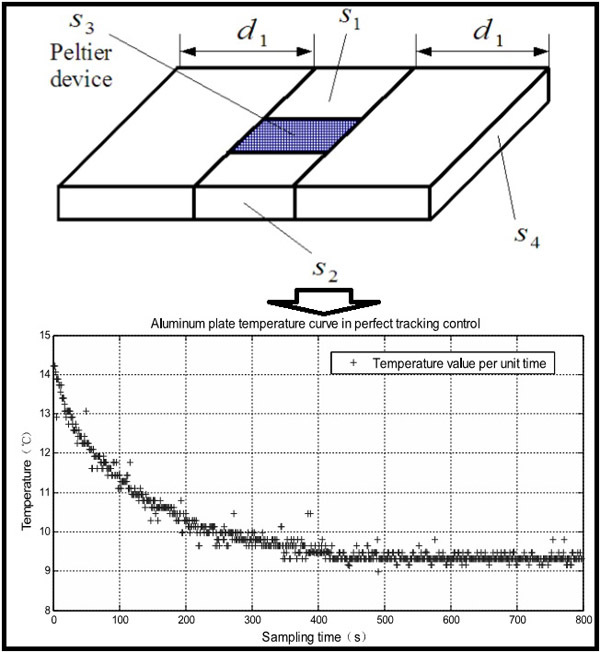 M. Deng, A. Yanou, Y. Tokuda, and A. Wang, “Robust fault tolerant thermal control system design of an aluminum plate with peltier device,” Proc. 20th Int. Conf. on on Advanced Mechatronic Systems, pp. 223-228, 2012. X. Chen and G. Zhai, “Observation for the descriptor systems with disturbances,” Nonlinear Dynamics and Systems Theory, Vol.7, No.2, pp. 121-139, 2007. J. Ryoo, T. Dohb, and M. Chung, “Robust disturbance observer for the track-following control system of an optical disk driver,” Control Engineering Practice, Vol.12, No.5, pp. 577-585, 2004. X. Chen, “Design of a nonlinear disturbance observer,” IEEE Trans. on Industrial Electronics, Vol.47, No.2, pp. 429-437, 2000. B. Cong, X. Liu, and Z. Chen, “Disturbance observer based time-varying sliding mode control for uncertain mechanical system,” J. Systems Engineering and Electronics, Vol.23, No.1, pp. 108-118, 2012. Y. Choi, K. Yang, W. Chung, H. Kim, and I. Suh, “On the robustness and performance of disturbance observers for second-order systems,” IEEE Trans. on Automatic Control, Vol.48, No.2, pp. 1-6, 2003. W. Chen, D. Ballance, P. Gawthrop, and J. O’Reilly, “A nonlinear disturbance observer for robotic manipulators,” IEEE Trans. on Automatic Control, Vol.47, No.4, pp. 932-938, 2000. K. Ohnishi, M. Shibata, and T. Murakami, “Motion control for advanced mechatronics,” IEEE/ASME Trans. on Mechatronics, Vol.1, No.1, pp. 56-67, 1996. C. S. Liu and H. Peng, “Disturbance observer based tracking control,” J. Dynamic Systems, Measurement, and Control, Vol.122, No.2, pp. 332-335, 2000. N. Bu and M. Deng, “Isomorphism-based robust right coprime factorization of nonlinear unstable plants with perturbations,” IET Control Theory & Applications, Vol.4, No.11, pp. 2381-2390, 2010. M. Deng, A. Inoue, and K. Ishikawa, “Operator-based nonlinear feed-back control design using robust right coprime factorization,” IEEE Trans. on Automatic Control, Vol.51, No.4, pp. 645-648, 2006. Z. Ma, A. Wang, and T. Chen, “Operator-Based Robust Nonlinear Control Design of a Robot Arm with Micro-Hand,” J. Robotics and Mechatronics, Vol.28, No.4, 2016. D. Wang, F. Li, S. Wen, X. Qi, and P. Liu, “Operator-Based Sliding-Mode Nonlinear Control Design for a Process with Input Constraint,” J. Robotics and Mechatronics, Vol.27, No.1, 2015. A. Wang, D. Wang, H. Wang, S. Wen, and M. Deng, “Nonlinear Perfect Tracking Control for a Robot Arm with Uncertainties Using Operator-Based Robust Right Coprime Factorization Approach,” J. Robotics and Mechatronics, Vol.27, No.1, 2015. M. Deng and A. Wang, “Robust nonlinear control design to an ionic polymer metal composite with hysteresis using operator based approach,” IET Control Theory & Applications, Vol.6, No.17, pp. 2667-2675, 2012. M. Deng and N. Bu, “Output tracking of nonlinear feedback systems with perturbation based on robust right coprime factorization,” Int. J. of Innovative Computing, Information and Control, Vol.5, No.10, pp. 3359-3366, 2009.